Monday was so busy that despite having the cards and photos completed and in queue, I couldn’t get to the composition of these posts! So I have a double-hitter today! See my other post here. 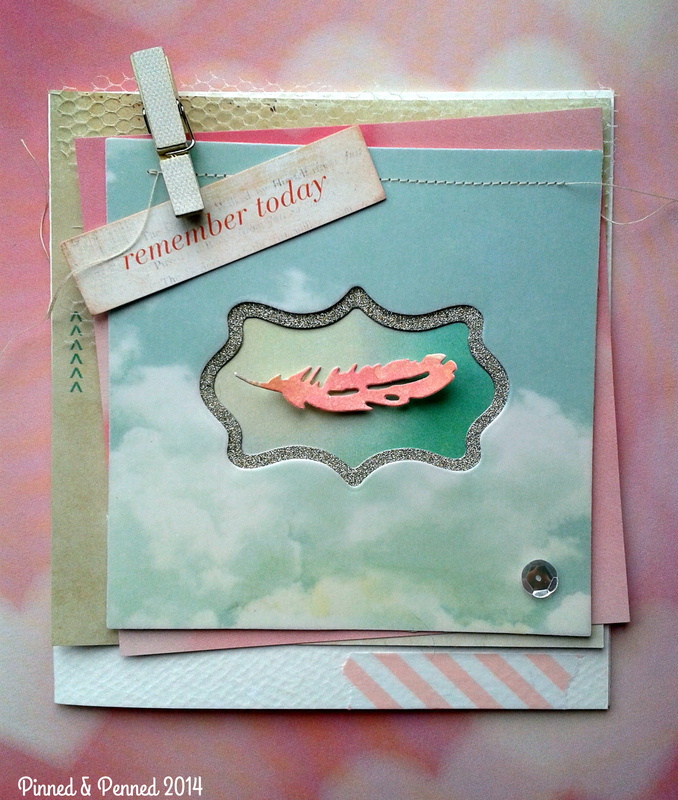 For my next card, which also features pink prominently, I worked from Wida Miller’s inspiration this week over at CASE Study. So excited she is the muse this month! 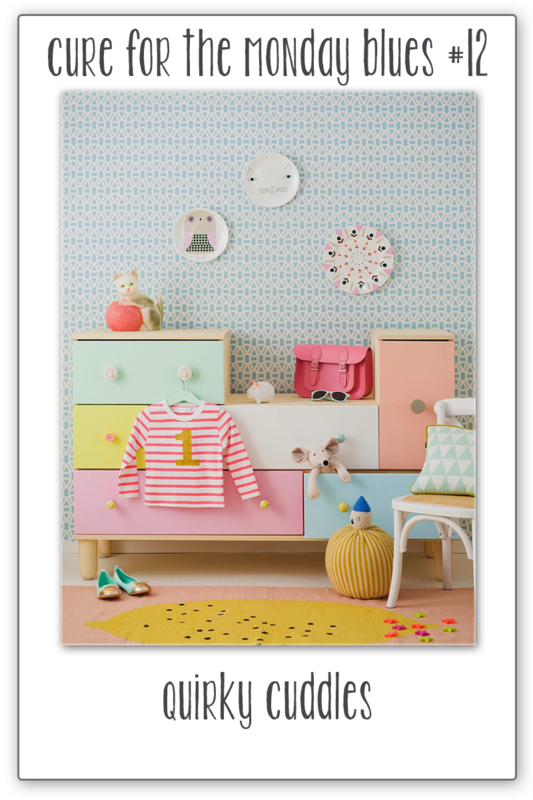 A bit more ethereal than Wida’s– but what I started from was her double frame and square orientation. I just received my Penny Black Feather and Frames dies, and when I saw her card, I knew the double frame would be perfect. 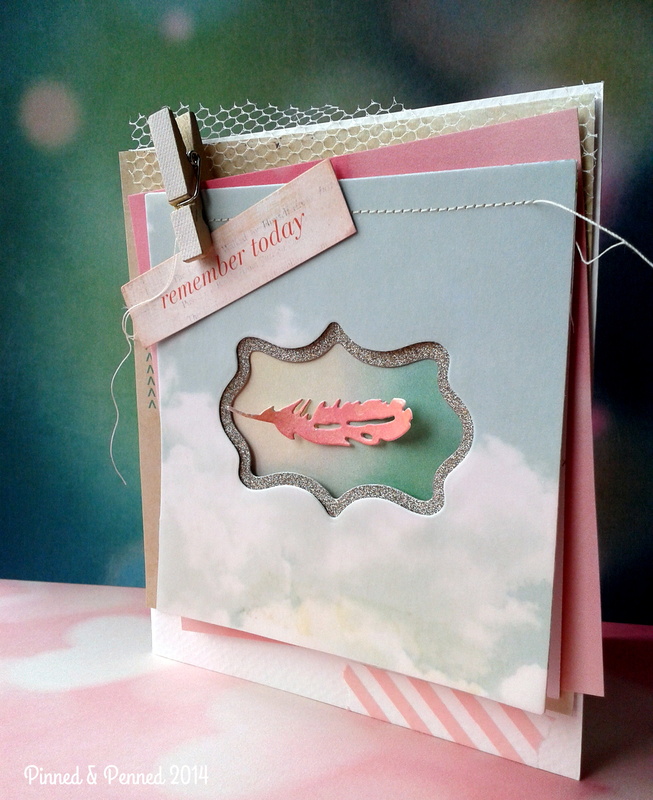 I’ve not jumped on the feather bandwagon–though I have some feather embellishments and stamps floating around (pun intended!). Her card inspired me to give the trend a try. 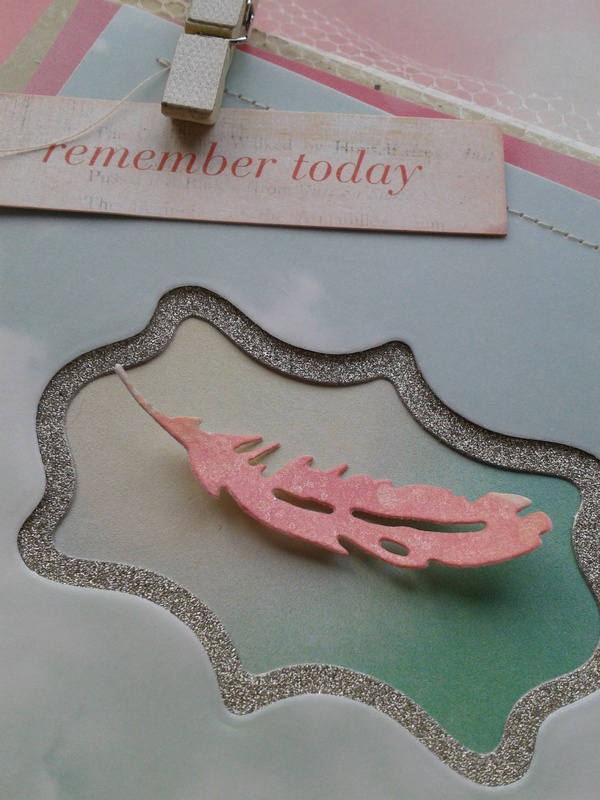 I also found myself echoing Amy’s design with her silver lining! 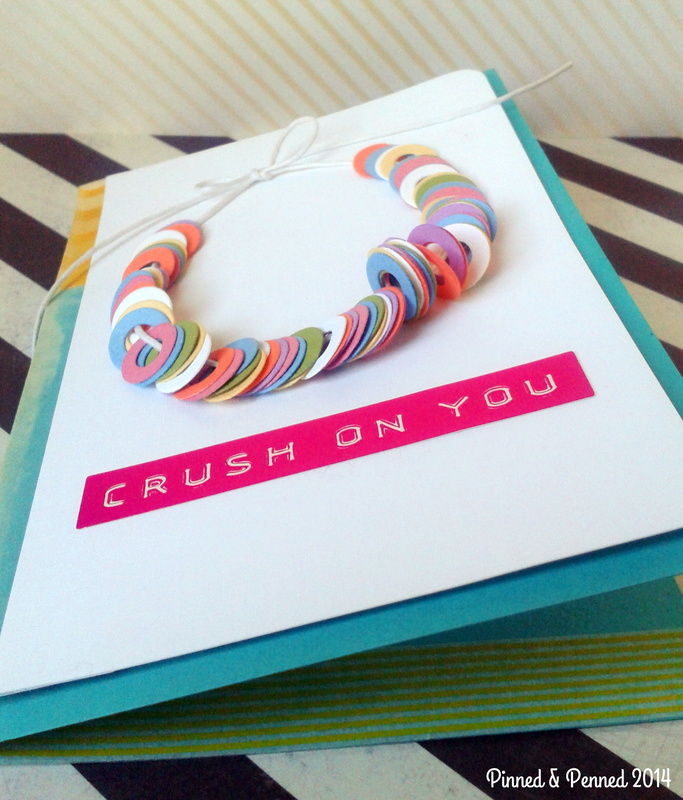 Love her card! 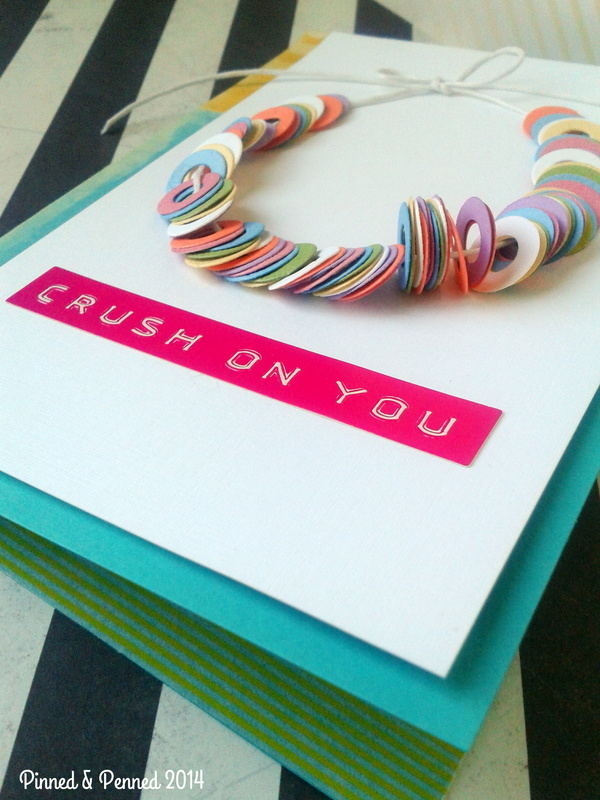 This card was so fun to put together– especially given the gorgeous papers that came in these amazing Crate Paper/Amy Tangerine discount packs at Michael’s (thanks for the tip, Amy Tsuruta!!). My card and the backdrop papers are specifically from The Best of Maggie Holmes pack. 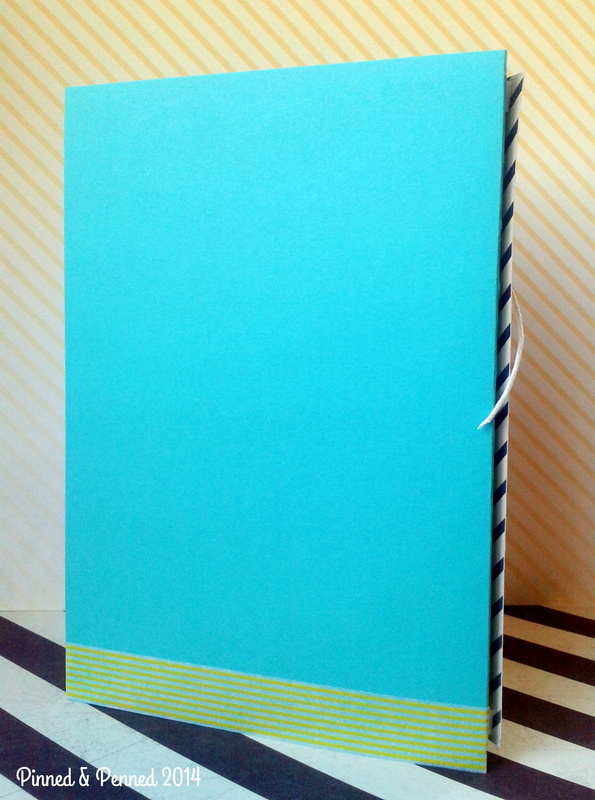 The tan base paper is from Crate Paper’s DIY Shop. 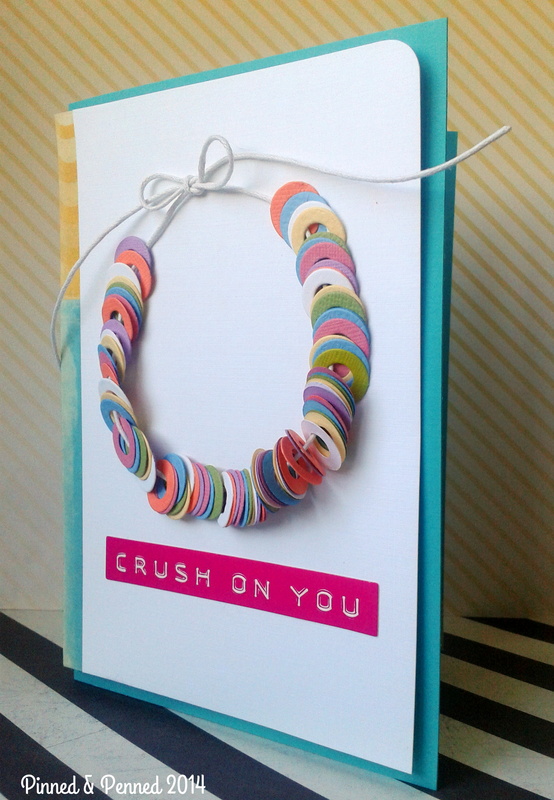 You can’t see it in my card, but the pink paper layer has bokah hearts all over it, a nod to Wida’s heart paper. 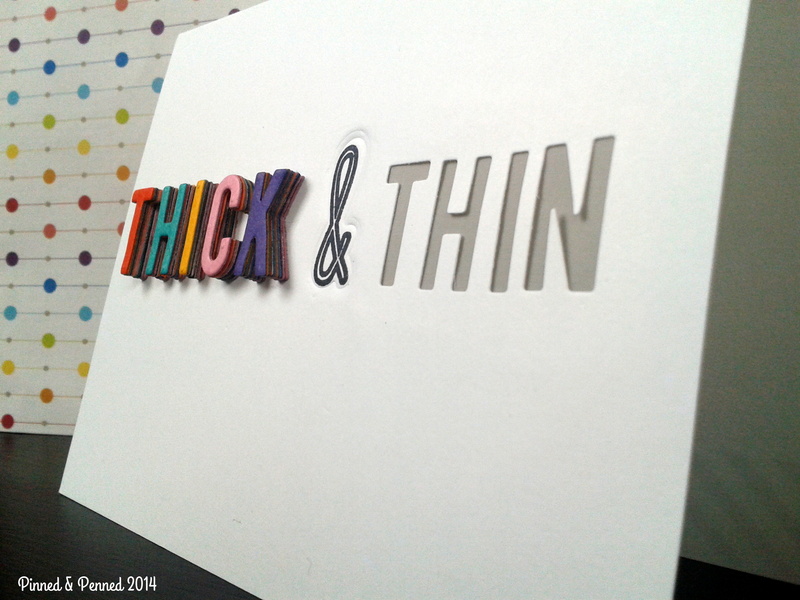 I’ve placed the card on the paper so you get an idea of what lies beneath! I like that the hearts are hidden like a secret beating within the body of the card. I strategically cut the cloud paper and covered it with a layer of vellum, adhering with a little Scotch vellum tape before I stitched the top. I also cut a specific part of the bokah paper that looked like a sun and placed that behind the frame, so it looks like the sun and it’s halo are peeking from the cloud range. I cut the sentiment from a notecard in the beloved Lucky Charms pack and distressed it with Tattered Rose, as it was too white for the card. I also Distress inked my feather with Worn Lipstick stain, and then spritzed with Heidi Swapp Coral mist to get the exact pink I wanted– along with a little sparkle! 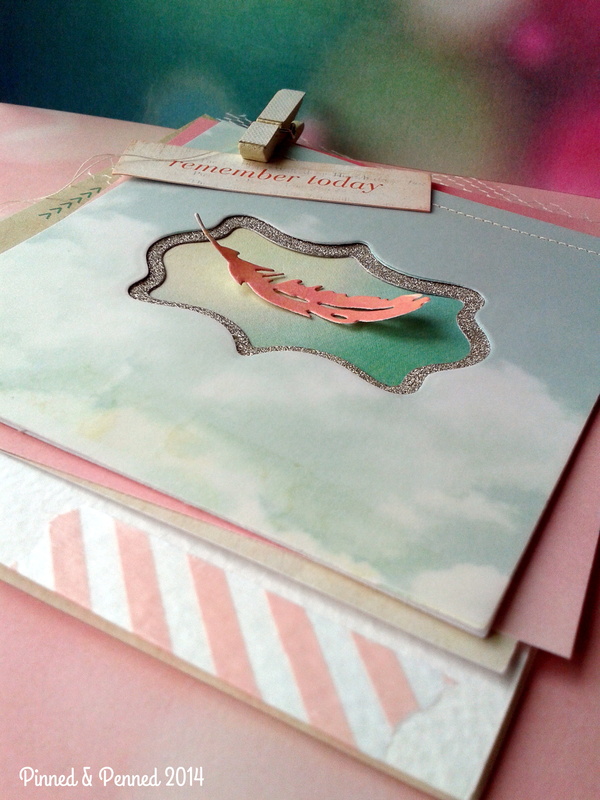 Here is the inside of the card, featuring a Verve Stamp that I just love! 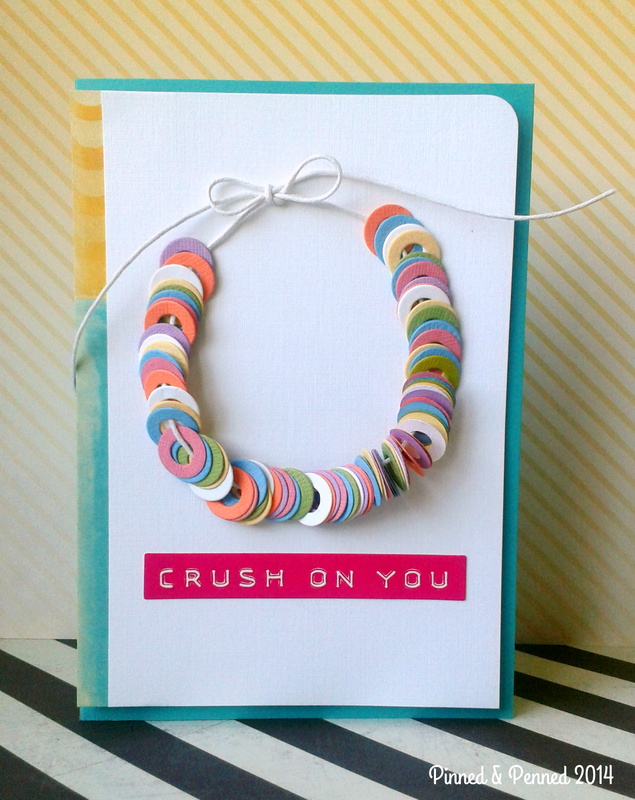 Now, I initially did not include the sequin on the bottom of the card. After taking photos and stepping back from the finished product, I just felt like something was missing. I think the addition of the sequin creates a nice line and adds subtle visual interest. What about you? To sequin or not to sequin? The bottom is finished off with some Little B washi! 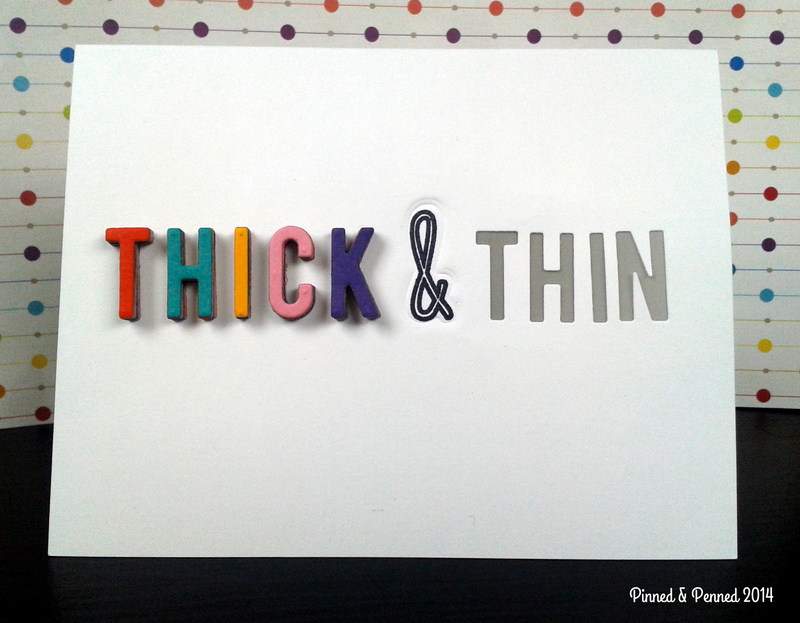 I thought this card would be perfect for someone working through a difficult time. Even in our darkest moments and most challenging days, we need to hold onto hope and move toward the light while we sit with the uncertainty. I think it’s important to remember the difficult days as it helps us to appreciate the better ones that will most certainly follow. I hope you are having a wonderful week– but if not, may you find the feathers you need to lift you up and the silver linings to make your cloud seem a little less grey. Thanks for stopping by! 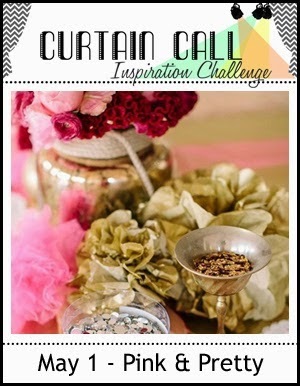 Head over to CASE Study and Curtain Call for some uplifting creations! P.S. 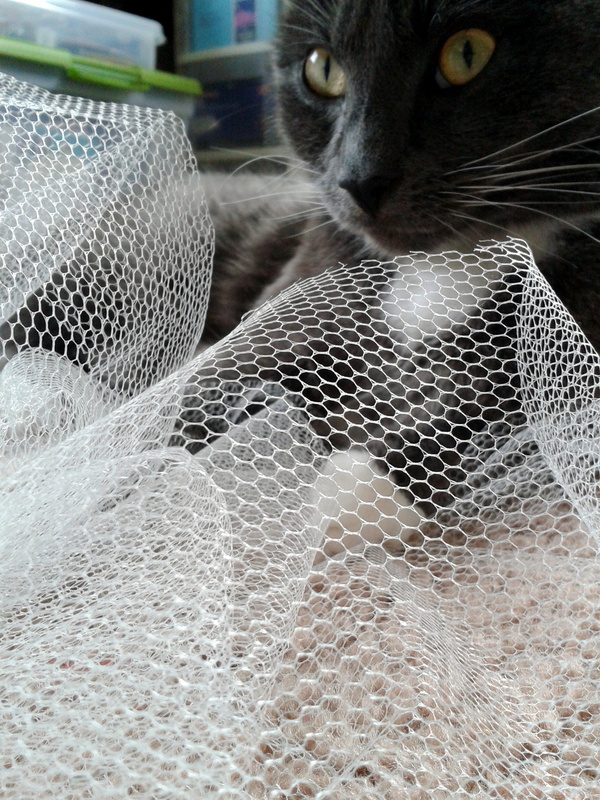 Almost forgot my crafty cat Leo who loves the tulle and keeps me company! Happy Vernal Equinox and welcome to a new week over at CASE Study! Let’s spring to it and see what inspiration was gathered from our muse Joni Andaya this week! A little background on her process is needed as it’s not readily apparent from the card. Lovely as it is, once you see how she manipulated the stamped image, you will find her ingenuity even more divine! So she stamped doubly this lovely image from PTI’s Basket of Blessings, then as you can see, die cut the baskets right out, leaving a lovely border of flowers. I have commented before how I just love it when I see people re-visioning their products, and this is no exception! So I, likewise, was inspired to see my products in a new light, specifically the Lil’ Inker’s cover-plate Stitches and Stripes die. While Joni cut her basket out, I wanted to not only innovate, but pull the basket back into my card. This is the result! 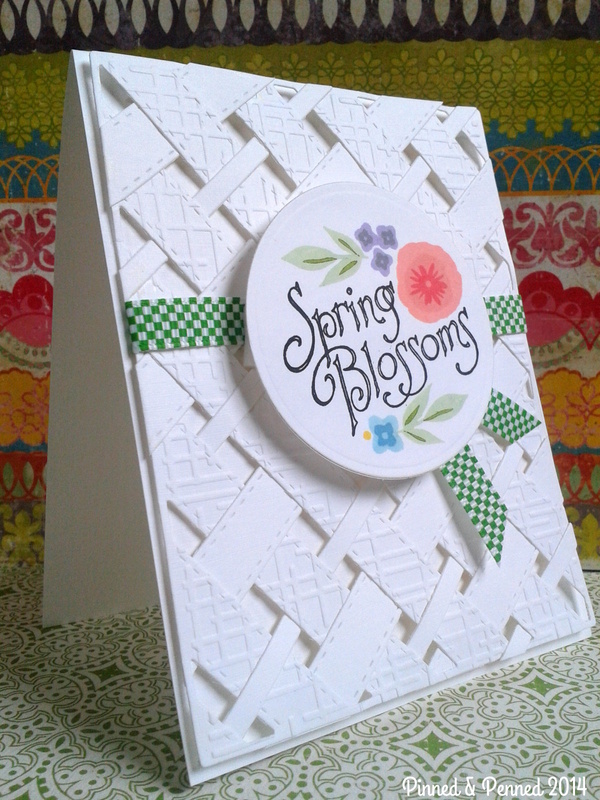 First, I cut the die out of White Linen paper, twice; then, I ran one of the die-cuts through the Lifestyle Crafts Woven embossing folder to add more texture. 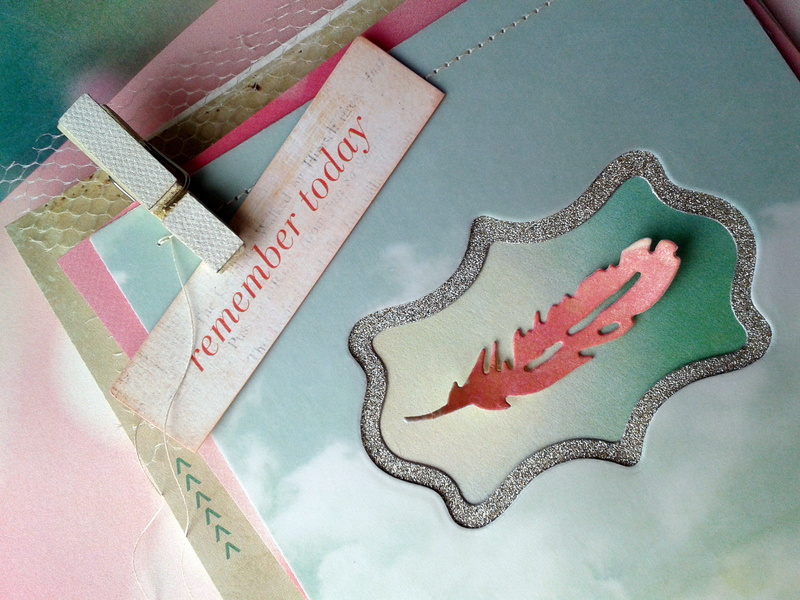 Next, I cut this embossed die-cut apart, and wove the individual pieces through the other die-cut. 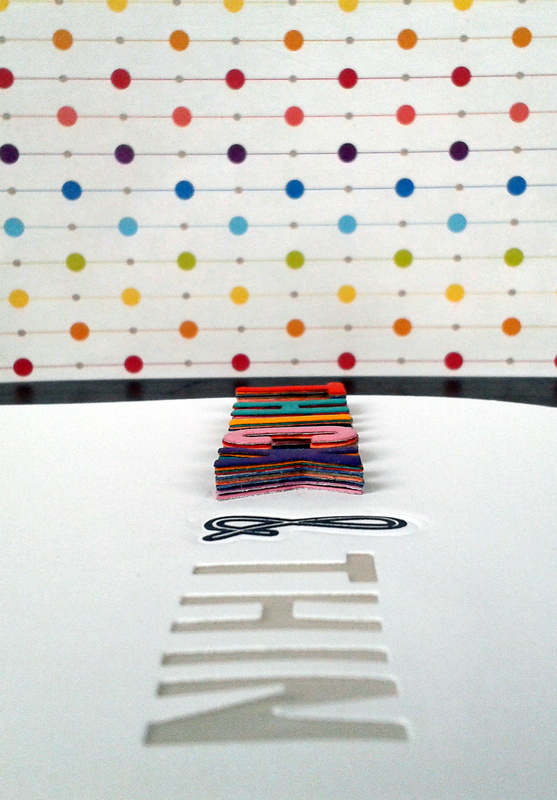 I adhered ends with a little dot of glue, and then cut off the superfluous strips that hung over the edges. 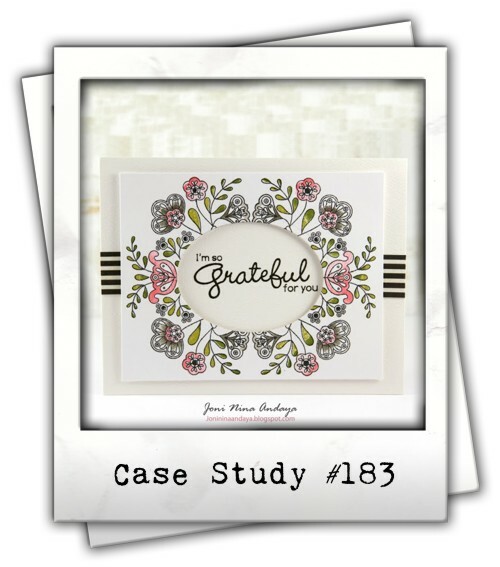 I cut the circle from the center, covered it on both sides (front and back) with larger circle die frames, and then covered that with one of my most best purchases, the PTI wreath die. 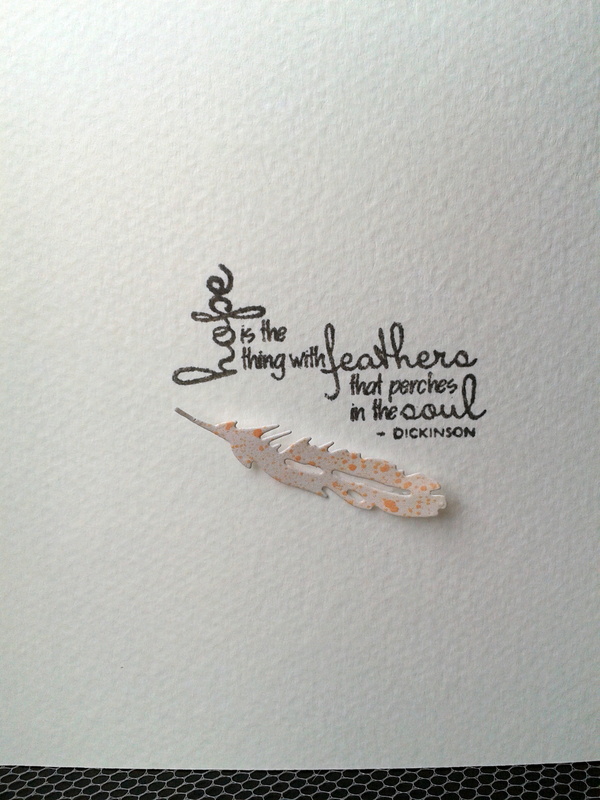 In the close-up below, you can see the lovely texture of the Ellen’s Essentials White Linen paper. 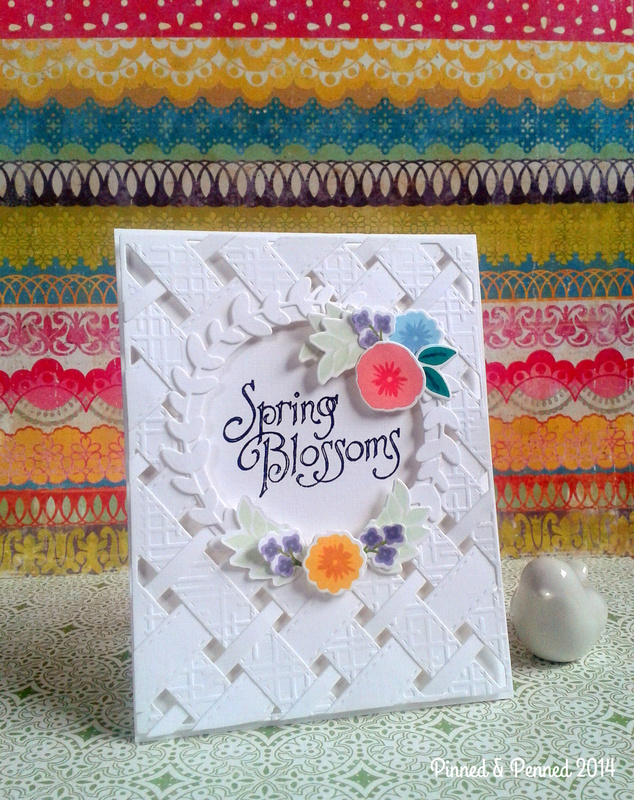 The Spring Blossoms sentiment is from that wonderful Graphic 45 Sweet Sentiments set I featured in my News of Spring post. Likely you recognize the ever-popular flowers from WPlus9’s Fresh Cut Florals set, stamped with Hero Inks and Memento dye inks. Placement, deciding on color both took me the longest. 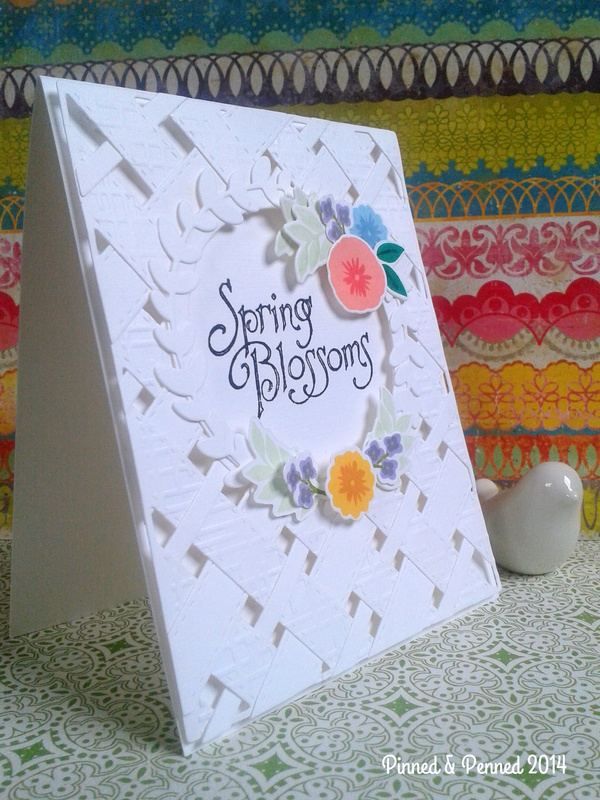 I can’t tell you how many dies I cut of the different flowers and leaves! Now I have plenty for additional cards! If you didn’t already know this, here’s a great technique for stamping die cuts. 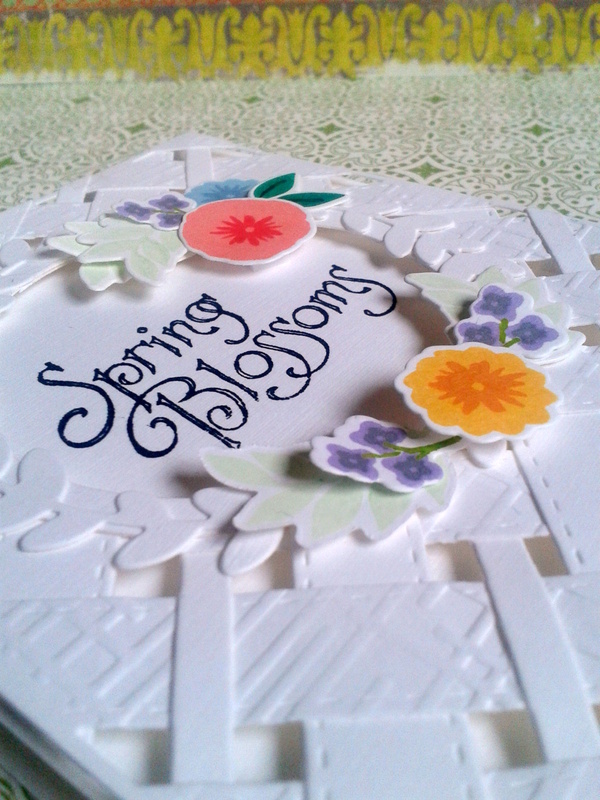 Start by die cutting your small shapes first, then with your inked stamp laying flat on your table, place the die cut upside down onto the stamp. It makes centering and inking so much easier. 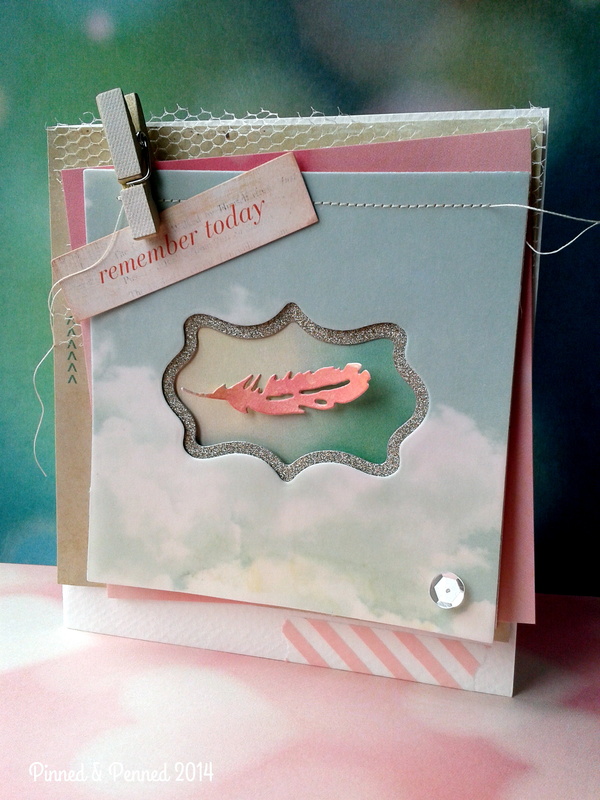 No more stamping first and then die cutting for me! 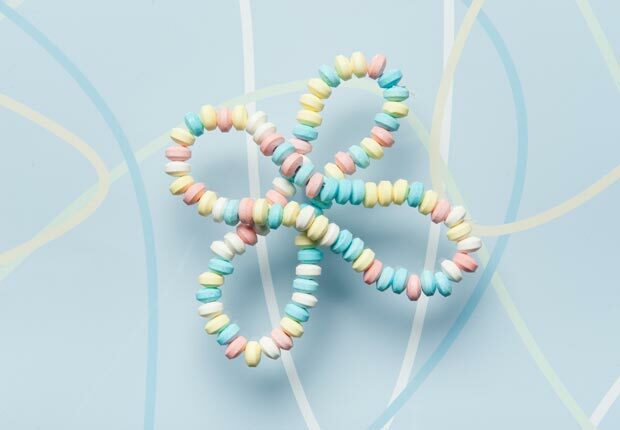 I have a few more of my woven Easter basket cards in the works using different colors for the background and different scenes (Lawn Fawn Easter Bunny and some jelly beans, perhaps?! ); I will be featuring them soon! 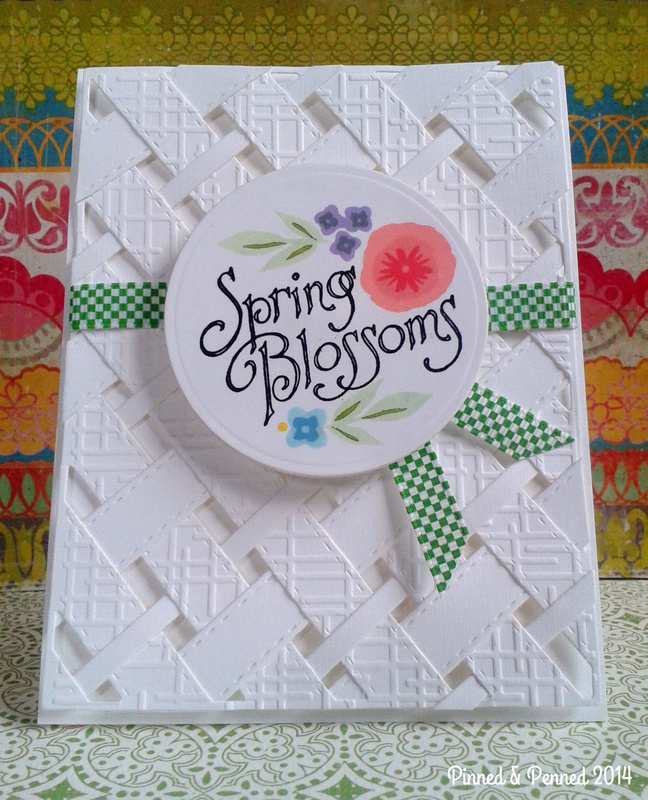 This was a trial card to practice the weaving and stamping ideas around the sentiment. I think I prefer the one above, but this one is sweet in it’s own way! Well, that’s it for me! I sure hope things are blossoming in beautiful ways wherever in the world you are. I encourage you to play along with us this and every week over at CASE Study. Head over there now to check out what the ladies have created this week, or blog hop through their individual sites below. You will leave with an overflowing basket of ideas for sure! 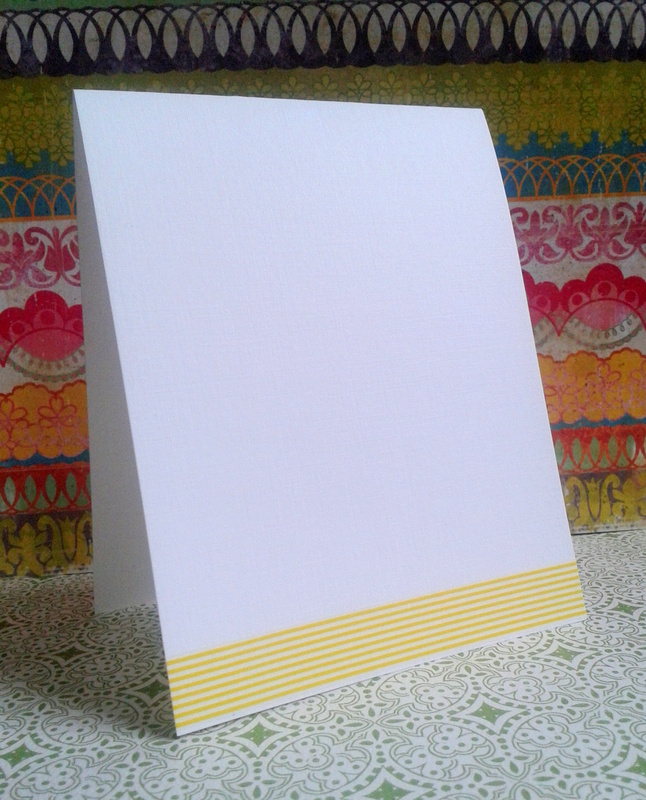 Today, I am keeping the post as clean and simple as the card! Materials: Mama Elephant alphabet dies; Papertrey Ink Grand Ampersand die (embossed) and stamp set; vellum; white cardstock; washi! 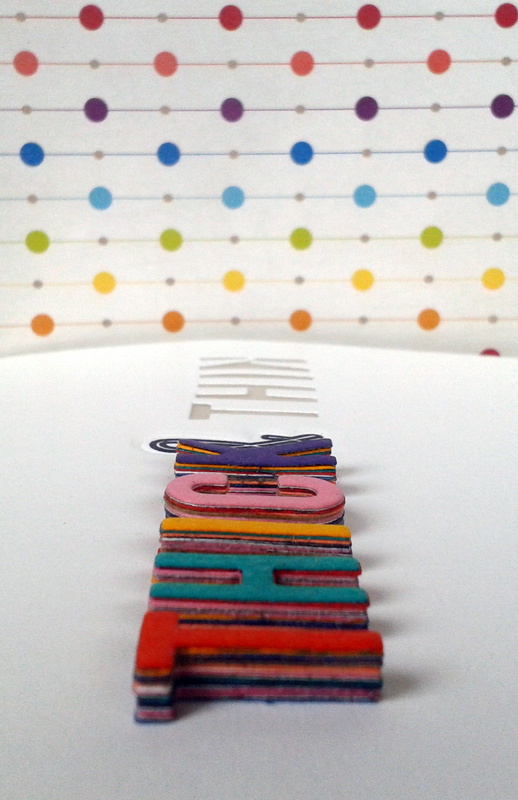 I was determined to make it to this week’s Make It Monday Challenge over at Papertrey Ink! 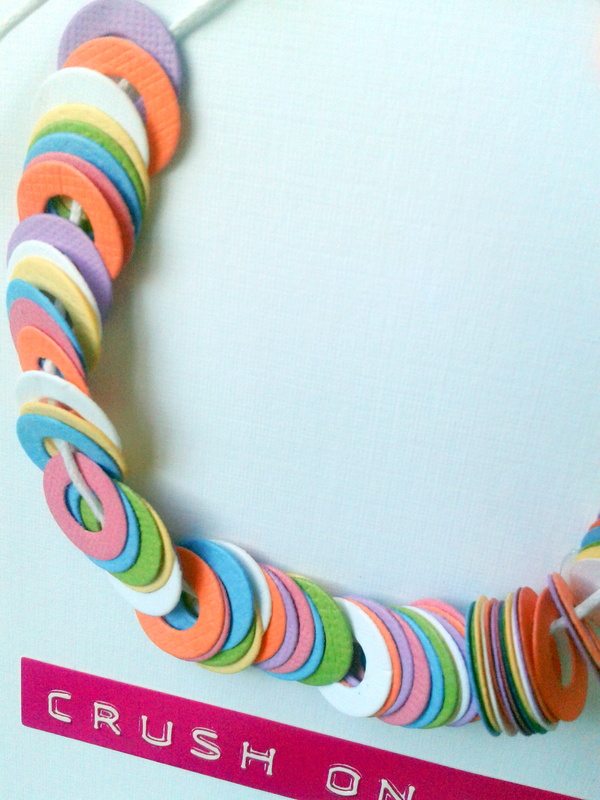 So I have been making quite a bit of merry in my craft room this afternoon! Here’s the first of the inlaid die cut cards showcasing one of my favorite cat dies from Memory Box! For this card, I used the same technique as on my Skeleton Dance card. Using the Sizzix snowflake embossing folder, I ran it through my Big Shot and then covered it with VersaMark Dazzle Stamp and clear embossing powder, heat-set and voila! 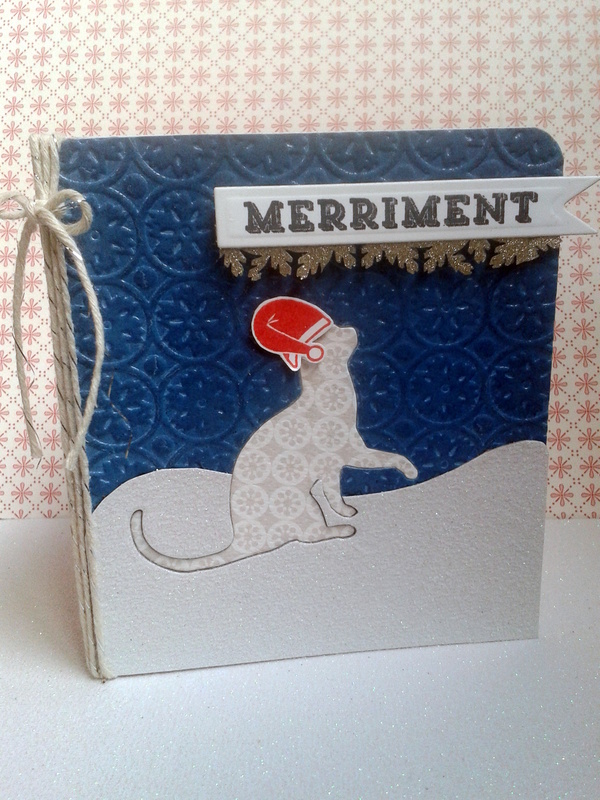 I cut the cat die into the embossed background and my hand-cut snow drift, then found a paper for the inlaid cat that complemented the scene! 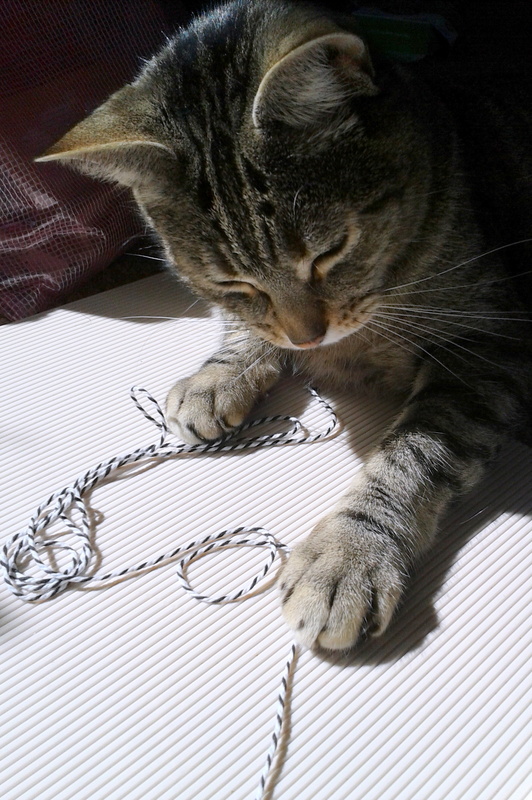 Papertrey Ink gave dogs center stage this holiday, and while I love those four-legged friends, I am at heart a crazy cat lady! 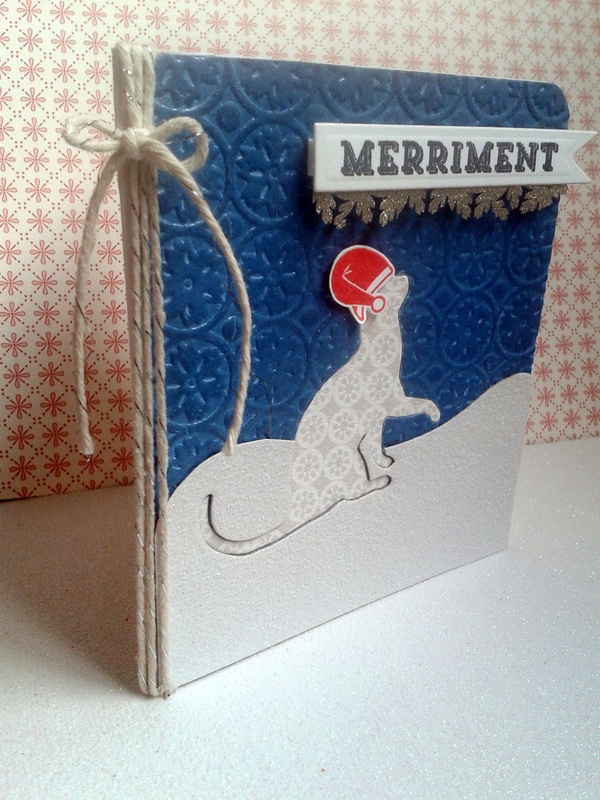 You may recognize the fabulous little Santa hat from Papertrey’s set “Come All Ye Faithful Additions”. I was so excited that he fit my curious cat! 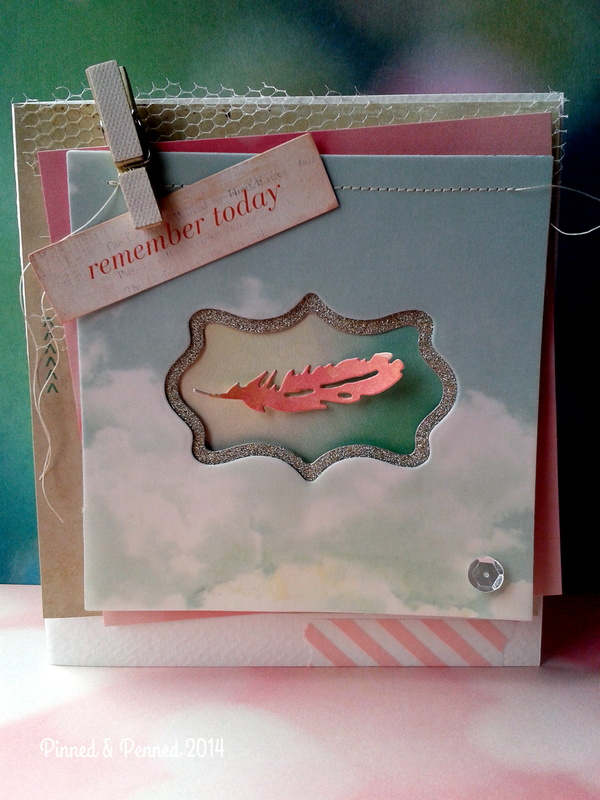 I stamped, embossed with clear powder and fussy cut. 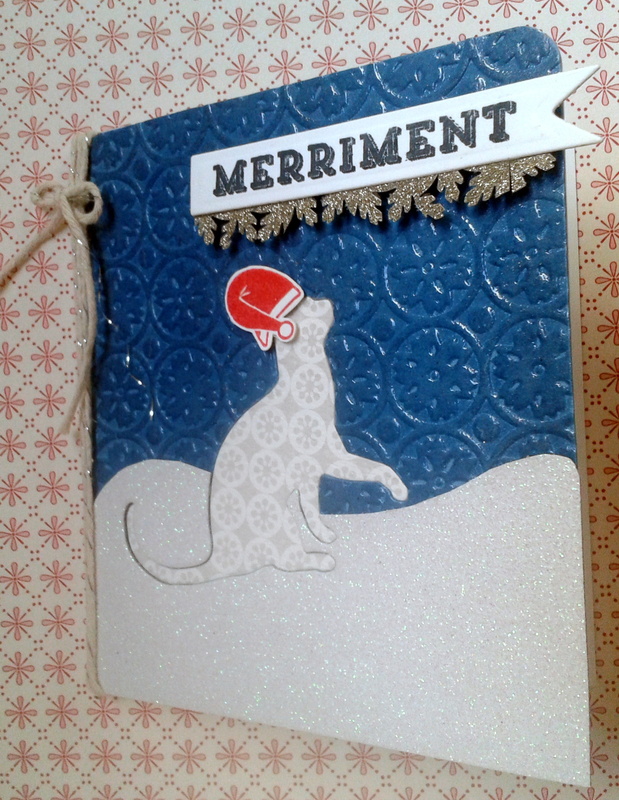 I then stamped the “Merriment” sentiment from the same Papertrey Ink set and die cut. Those wonderful icicles? Well, my mom bought me a Fiskars snowflake punch last year, and after playing around with it for another project, I realized it had multiple functions! Don’t you love it when you can use one tool so many novel ways? 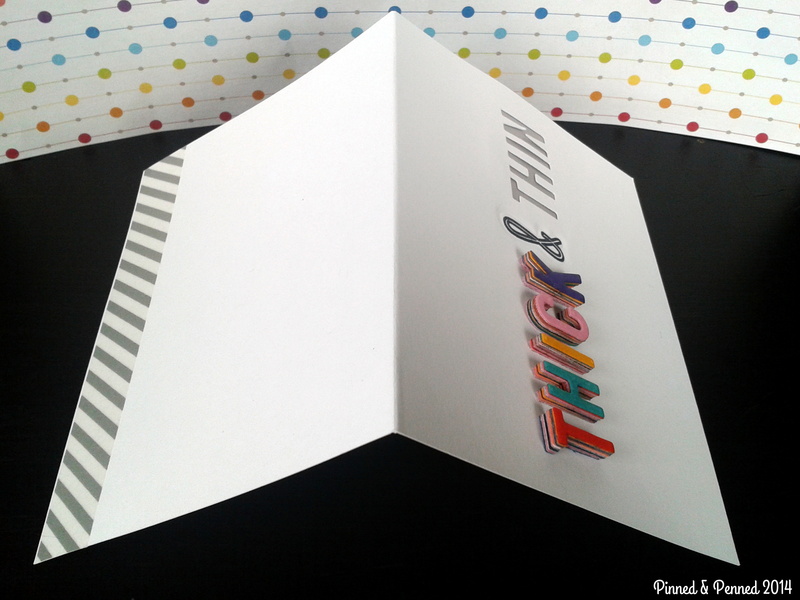 So I cut and adhered the icicle strip to the flag and along the back of the card! 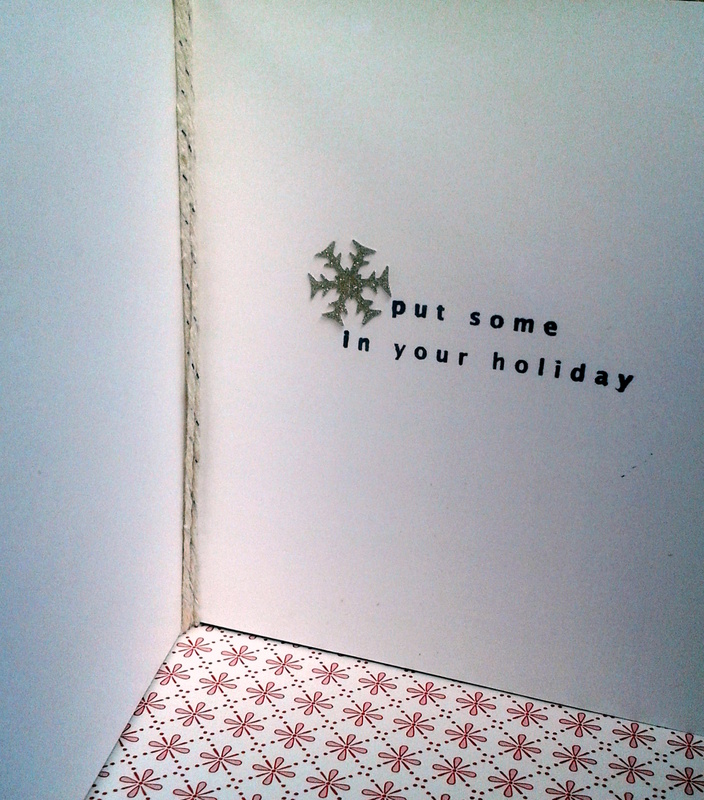 The inside stamp is also Papertrey Ink, and there’s that snowflake in its entirety! 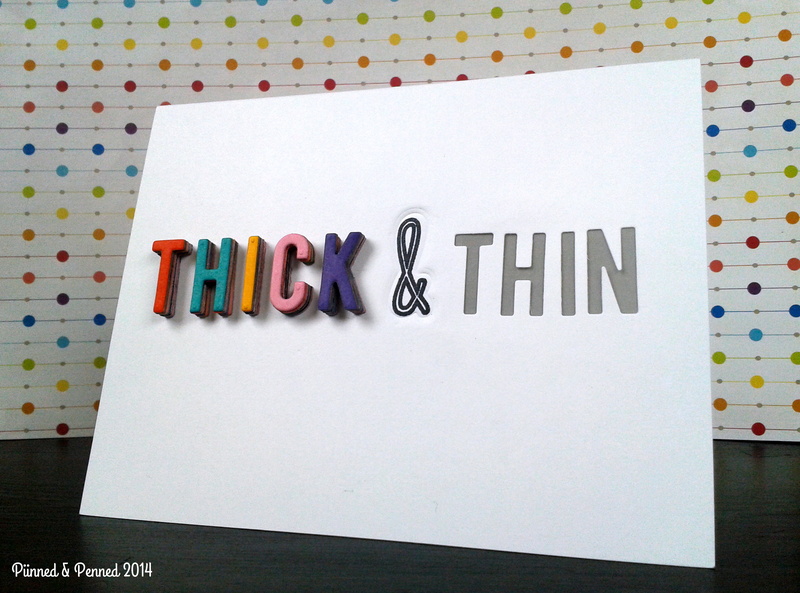 Don’t you love the glossy nature of the double heat-embossed paper? Shiny and bright for the season! Speaking of paper: I used a variety from my stash, mostly from Impress Stamps here in Seattle. 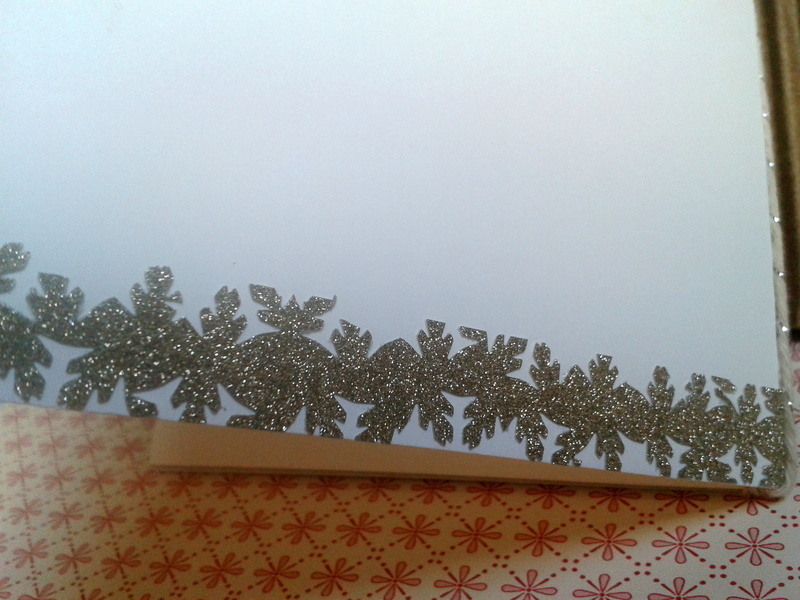 The card is heavy stock from Gina K.
This snowflake pattern also reminds me of those wonderful 19th century tin ceilings. I am thinking he needs a bell around his neck, and some of my white Flower Soft on the ball of his Santa hat! What do you think? Any suggestions where to find a tiny bell? Maybe a bell brad would work! 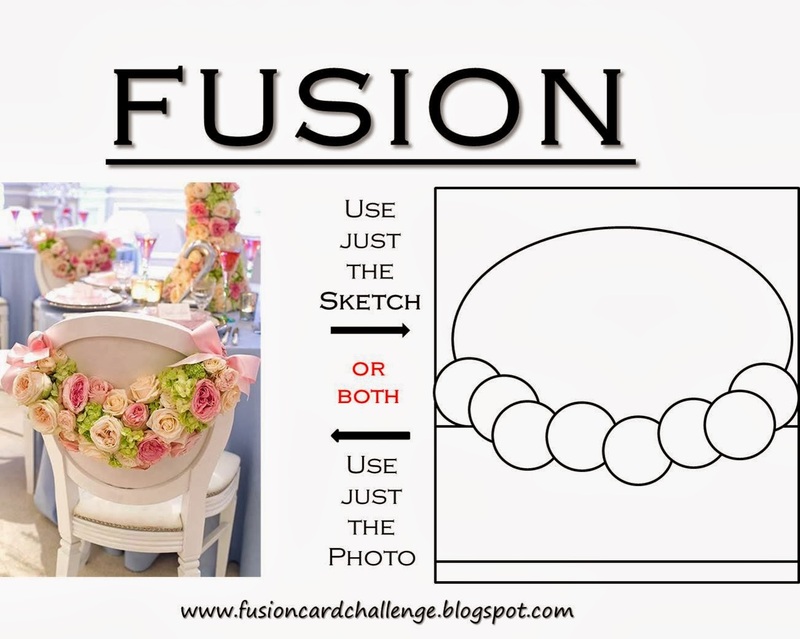 Prior to this challenge, I actually made an inlay die card for World Card Making Day/Thanksgiving, which you can see here! I also have a Seattle Skyline inlay die card I have yet to upload (but will very soon! Trying to catch up!) that I made for a friend who recently relocated to Utah. 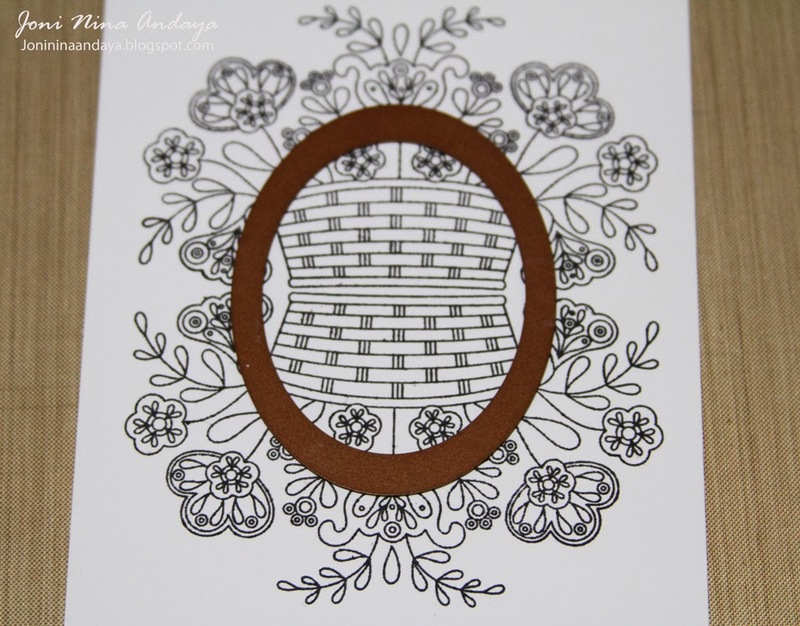 Slide on over to Papertrey Ink to see what others have fashioned for the challenge! It’s merry indeed!